Last Sunday in church this little girl, who has a beautiful voice, sang a couple of songs for the Lord. 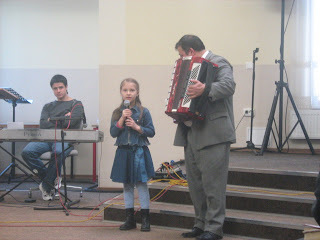 Accompaniment by an accordion is typical in Moldova, where few churches have pianos although some have small organs or electric keyboards. This week at the mission base was busy as usual. Our missions students are out of town on outreach projects and so the mission centre was used for a football conference. (Remember, North American people, football means soccer in Europe.) 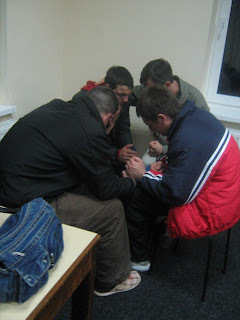 Here in Moldova sports ministries are developing more and more as a form of outreach. This conference was attended by coaches or people hoping to start a team in their village. At the conference they learned soccer skills along with how to share the gospel through sports. They received training in leading Bible studies and in mentoring and discipling young people. All who attended were guys, outside of our own team members, and all seemed very enthusiastic about keeping in touch with one another and encouraging each other in their new project. 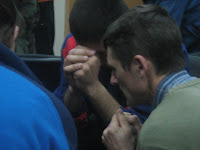 One of the things they learned, which we emphasize in our mission, is the importance of prayer. How can we be part of the work God is doing if we never stop to consult the Master about the part that He has for us to play in His work? It was an encouragement and a joy to see these young men praying fervently as they launch out to share the gospel with young people who want distraction and fun but who desperately need a reason to hope, and a reason to live. It always seems to me that prayer is one of those things that we must constantly struggle with. It's so easy to tell someone you will pray for them, but so hard to be faithful in that. I know that I don't pray nearly enough, although I intend to. But if we get together with other believers and spend time sharing and praying about the concerns of our lives, it is easier and makes us stronger. The hard part is that it also means we have to be vulnerable to truly benefit from praying for one another. 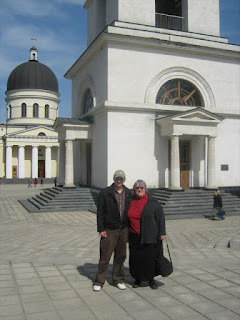 One of the joys for me of returning to Moldova was to see again some of the people I have been praying for and missing. One of them is my 'adopted son', Lilian. We had a chance this week to spend some time together and it is always a blessing to hear how God is working in his life. Mentoring young men and women like this is one of the privileges of my ministry here. Our team is fairly close-knit and some have real servant hearts. Our friend V. is back from North Africa for a short while and we have learned that V. knows how to cut hair. 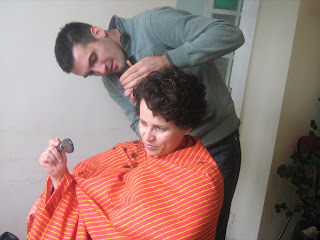 He served Ivanir this week by cutting her hair for her, as she supervised as closely as she could. He did a great job! Before he leaves Moldova again, I may just ask him to cut my hair too! 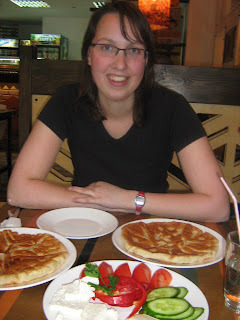 On Friday evening of this week, I took one of our newest team members out for supper at a Moldovan 'fast food' called "La Placinte". What you see on the plate is placinta (pronounced pla-chin-ta) - a pastry that can have various types of filling: cabbage, potato, soft cheese (brinza) or sweet filling: cherry, apple or pumpkin. Alida has come to us from Holland and her main responsibility is teaching the children of the Dutch family who are here with us. They will be returning to Holland later in the year and they need their children to be sure to be prepared for entering the Dutch school system. I had a nice evening with Alida, who helped me shop and carry my groceries up to my apartment. Then we watched a movie together, and just enjoyed getting to know one another. It's been a good week, one hemmed in prayer and refreshed with friendships - new and old. I hope you have a great week this week! Posted by Barb at 1:14 p.m.
Wow...V. i-a tuns parul lui Ivanir?!? :))) Apartamnetul tau este foarte fain!!! Si Alejandro este al doilea cel mai dragut baiat din lume(dupa Filip):).